Bluetooth Before the Internet: What Ideas Are Transmitted by the Jelling Stones of Denmark? Harald Bluetooth survives history as among the most famous Viking chieftains, primarily because his personal rune stone has been repurposed for the Bluetooth software programmed into our phones, cars, audio systems, and so on. But Chieftain Bluetooth (Harald, for the purposes of this article) played a much more significant role in history. 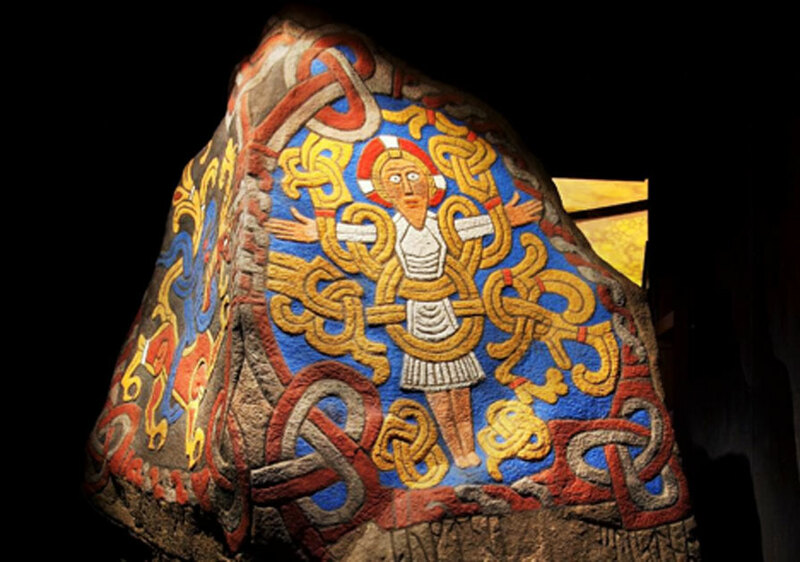 His strides toward Christianizing Denmark inadvertently aided the countries known today as Sweden and Norway into adopting the same faith, while he simultaneously created the most monumental rune stone complex that survives from the Viking world. These stones continue to stand in Jelling, Denmark. Jelling, (pronounced y-elling), can be considered a physical representation of the Danish transition from the Norse pantheon of religion to the new (the Danes) religion of Christianity, which took place between 953 and 965 AD. The Christianization process was, however, a lengthy one, and can be traced even before these dates. Erected around 965 AD, these rune stones portray various scenes from the pre-Christian mythology of the Norsemen symbolically overcome by numerous depictions of Christ and Christian imagery. The Jelling stones are often called by tourists and proper scholars alike the "birth certificate" of medieval Denmark—that is, it stands as a contemporary documentation of Denmark's Christian beginnings. It should be understood that Denmark, Norway, and Sweden did not exist in the way they do now during Harald’s time. However, the people under Harald called themselves the Danes, and they were highly concentrated in the area we now call Denmark. All references to countries in this article should be taken loosely as opposed to literally. The Jelling rune stone "complex" was technically begun by Harald's father Gorm during Gorm's reign, though Christianity first began to take hold of the area sooner. (826 AD is often considered a pertinent date as Gorm's predecessor Harald Klak was baptized Christian in front of the Frankish emperor, Louis.) Gorm's stone, much smaller than the one Harald raised nearby, was engraved for Gorm's wife and Harald's mother, Thyrve. Harald added his political successes to his father's dedication in the form of a second, larger stone erected to stand beside it. This stone describes in the Norse language how he "won for himself all of Denmark and Norway and made the Danes Christian." On this stone, a Norse dragon is carved, reminiscent of a sea serpent, as that is how dragons were viewed by the people of Scandinavia. On the opposite side of the stone is the first depiction of Christ in Northern Europe, at least as far as scholars can tell given the surviving materials. This depiction of Christ is very northern in its elements: Christ is on the cross, though his limbs are entangled with serpentine ropes that are indicative of the Jelling style of Norse animal art. This Christ is also bearded, as few Norse men were clean shaven, and he is garbed in the clothes of a Dane. Beneath the image is the runic inscription. During his reign, Harald added to these two rune stones by building two large barrows and a church. The rune stone that Harald erected himself stands precisely in between the two barrows. The white-washed stone church which presently stands at Jelling is not the original church, however. In Scandinavia, due to their prominent supply of wood and their lack of more long-standing resources such as stone or marble (as seen with the ancient Greeks), both religious and non-religious buildings were made of wood. Therefore, most do not survive. The original church at Jelling would have been wooden, and archaeologists have found three different churches underneath the current church. This indicates that the church was reconstructed at least twice before the stone one was completed, further indicating the importance of this site to the people of Jelling.